Charity here with the June Design Team Extravaganza. as well as the Kreaxions Circle Cutter. is up first today. She used Punch #301 to add stars to this patriotic number. with strips of the Stars and Stripes for color. to make this celebrate card. Click my name for a tutorial! The decision has been made to put the team on hiatus for now. We have thoroughly enjoyed posting our projects for you to enjoy. Thanks for all your attention and time. 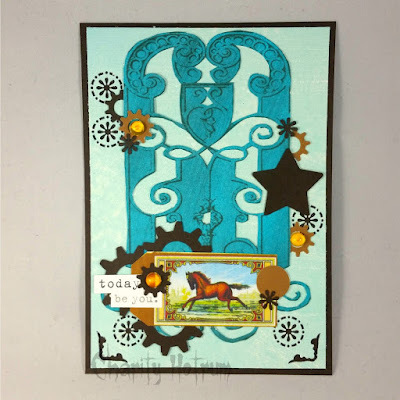 I used punch #301 to create this sweet card.....I punched a row of this image on a sheet of plain cardstock, then used it to stencil the stars, and "fireworks" as I like to call them! Makes for a pretty, festive card! Thanks so much for stopping by today! Happy Memorial Day! Today I have instructions on how to make a terrific card using gears for a new look. My favorite card sketches offer placement for flowers. 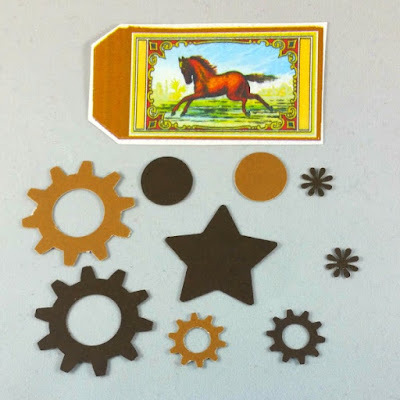 To use such a sketch for a masculine card apply gears or stars as your go to shape. When using a gear the shape can be punched into the base of the card. 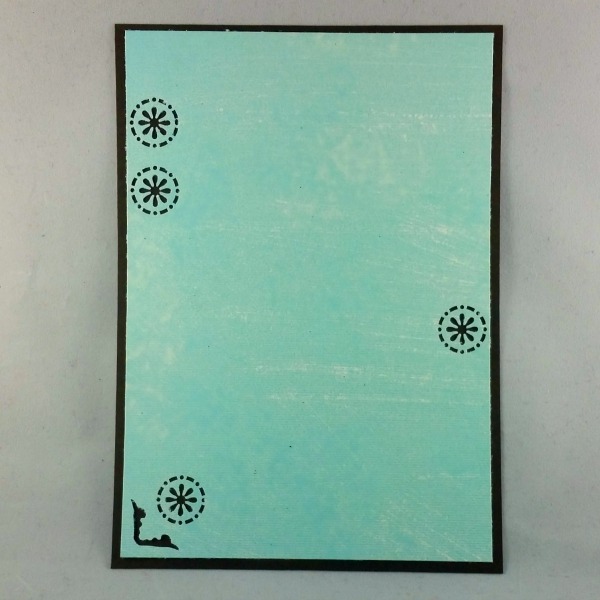 Back it with a contrasting color and the card design begins to take shape immediately. Here the 4.5x6.5" top layer is cut from light colored cardstock and the dark under layer is 5x7". These gears are punched with Kreaxions Punch #902 which can be purchased from Just Imagine Crafts. They work for a steampunk style as well. To add to this theme fussy cut a trellis or other wrought iron shape. If the design is overly involved cut portions with a craft knife and leave the rest. The papers and dew drops for this card are from The Robin's Nest. 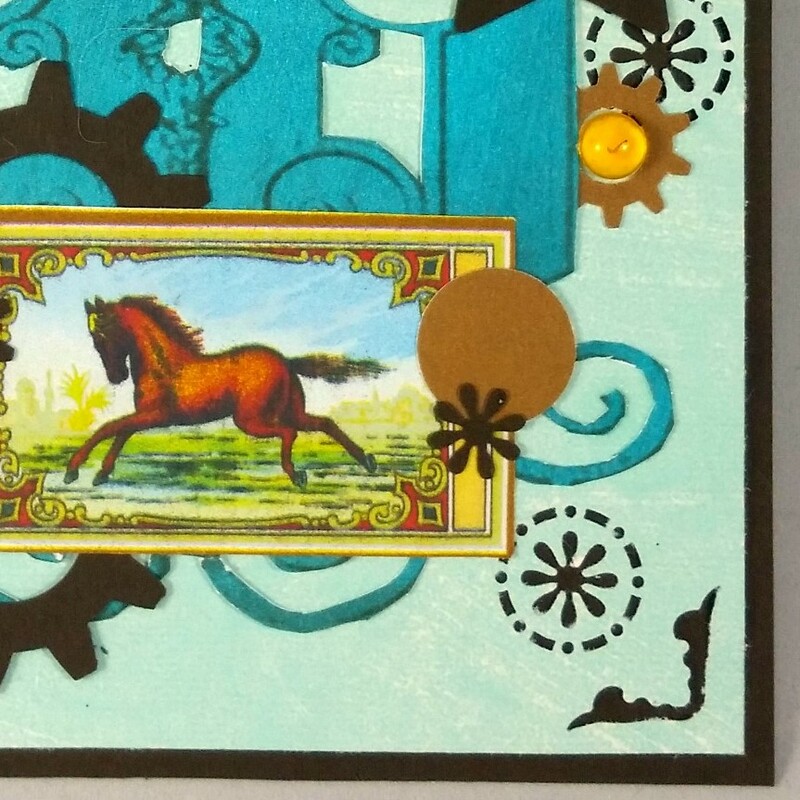 I used a horse tag sticker and punched stars, circles, and gears from cardstock. The lower corners of the card I punched with Kreaxions Punch # 902 and Insert B.
ScraPerfect has adhesive and tools that are very effective with these type of embellishments. The Dew Drops adhere easily with the Best Glue Ever. It's a breeze to add drops of glue to the thin portions of the gears by attaching a No Clog Writing Cap to the glue. Punches or stencils? Well, BOTH of course!!! I could see this being a lot of fun to make different designs on any card!!! than just a regular punch!!! Why not give them a try?? Please visit my blog to see this and many more cards!!! Layering the positive and negative pieces from the punch to create layered ruffles. 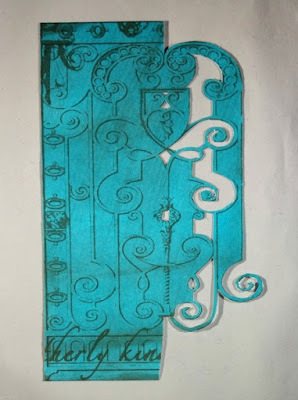 Using the positive piece from the punch to create a border strip for the top of the card. Charity here with May's installment of crafting skills from fabulous designers that you need to see! Offers us this adorable Elephant card. She used the Kreaxions Circle Cutter behind the elephant. Punch #918 puts in appearance on the lower border. Used pastel colors for this card. Punch #311 on the border, decorated with pearls make a gorgeous card. This lovely plaid card with a 3-D baby buggy delights with Punch #304 as a border. I used Punch #923 with Insert A for the corners and Insert C for the border. The flowers are the pieces from Punch #306, Punch #902, and Punch #910. Follow the links to order yours!!! The doily has the ink on it from using it as a stencil to create the fun effect on the die cut butterfly. I love using pieces that might otherwise go in the trash, but instead use them to inspire something new! Hope you are inspired too! Thanks for stopping by today! 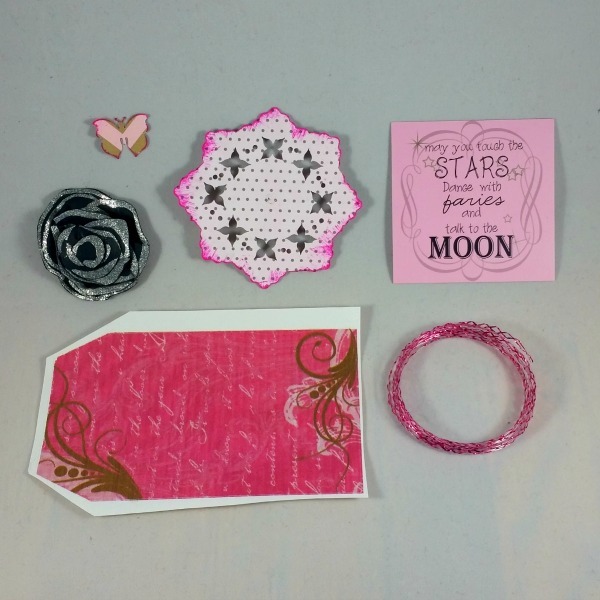 Remember to stop by the Just Imagine Crafts store to find these butterfly finds! used Punch #604 for the butterfly to the right of the doily. The spiral 3D paper roses were made from a single sheet of cardstock pictured below. Find it and the other beautiful papers and embellishments used for this card at The Robin's Nest store. Step 1) Carefully cut a rose along the silver outer edge. 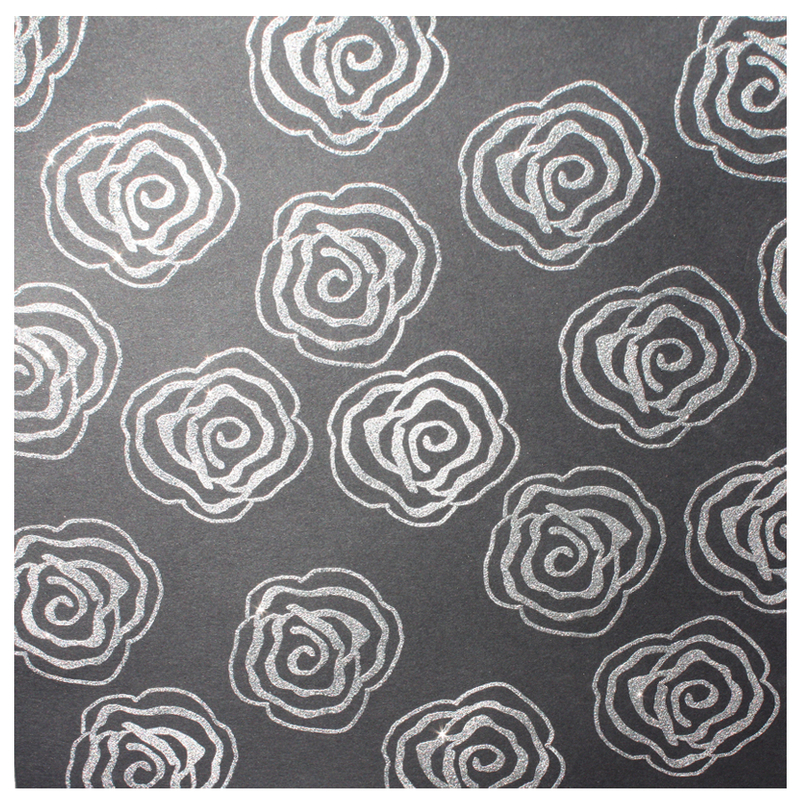 Step 2) Cut that rose into a spiral, using the silver line as a vague pattern. Step 3) Starting at the center, curl and glue the paper into a rounded shape. Press the glued surfaces together until the adhesive bonds before moving onto the next portion. ScraPerfect provides the exact adhesive needed for this project. The Best Glue Ever is the just-right bonding strength and the large No-Clog Writing Cap allows you to place a single dot of glue at strategic points. Here is a quick peek at all the design elements I used for this card. In the US Kreaxions product are available from Just Imagine Crafts. This card has a 5x7" cardstock base with a 4.5" x 6.5" layer over the top. Almost everything on this card is recycled!! Lace flower I made from old lace. Other flower I found in the house we just moved into. It was a pin. Of course the card board is from a discarded box. The paper swirls are from a die cut that messed up. I cut the good parts off and used them. The silver button and leaf was also found here. The butterfly was a trial die cut. I added some ink with sponge to make it look old. The little glass bottle came from dollar store with nail glitter in it. I put tiny gemstone chips in it. I hope you enjoy my card! Recyclables are everywhere, you just have to look!! I love this Butterfly die by Kreaxions.. If you have a die cutting machine you will love this Kreaxions thin "Butterfly Die"! Since the Design Team featured the "Butterfly Die" for their reveal on the first I thought I would use the die again, but in a different way. I used the negative piece from the die to create this card. After making my base card out of white cardstock I covered the front with washi tape. I then cut out two butterflies using the die and used the negative pieces. I adhered them to the front of the card over the washi tape and added my sentiment. This has been such a fun and versatile die to work with ... so many ideas and so little time.